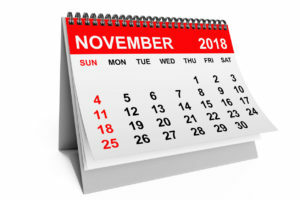 October Is Over - FINALLY! October certainly lived up to its reputation this year with the stock market down approximately 6%, and small company stocks down 10% during the month. The U.S. stock market is now up a mere 2-3% on a year-to-date basis after the recent October decline. On October 3, 2018 the Federal Reserve Board “FED” made it clear that it plans to raise interest rates for the rest of 2018 and into 2019 as it changed its monetary policy from “accommodating” to “neutral”. The stock market has been concerned for several months about trade tensions, especially between the U.S. and China, and then responded swiftly to the downside shortly after the FED announcement. Why is the U.S. stock market not up 20% in 2018 in lockstep with corporate earnings? The stock market looks ahead as it did in 2017 when the market was up 19% and corporate earnings were up 12%. In 2017, investors were anticipating the positive earnings effects in 2018 of corporate tax reduction, a weaker dollar, and an economy gaining momentum. Currently, economists, strategists and analyst are estimating 8-10% earnings growth in 2019; And investors are becoming less certain about the earnings growth outlook. Stock market valuation has declined since the beginning of 2018: A Good Thing! The most referenced stock market valuation metric is the price-to-earnings ratio “P/E”. The stock market is up 2-3% so far in 2018 while corporate earnings are up over 20%. As noted above, investors estimate 8-10% corporate earnings growth for 2019. The confluence of stock prices and earnings growth has brought down the P/E ratio from 18.2x at the beginning of 2018 to the current 15.4x, which is right in the middle of the 15x to 16x historical average. The U.S. economy is performing well above trend; Real Gross Domestic Product “GDP” grew 3.5% in the September 2018 quarter, following a 4.2% growth rate in the June quarter. “Real’ GDP is a measure of economic growth, excluding the effects of inflation which is approximately 2%. So, if we add real GDP and inflation, final goods and services produced were up over 5% for the September 2018 quarter. Personal consumption, business investment, and government expenditures all added to economic growth in the quarter. The one concern is residential real estate which showed contraction in the quarter, very possibly due to interest rates rising. The job market could not be better for job seekers, with 250,000 additional jobs in October 2018, well above expectations and a steady 3.7% unemployment rate as more people joined the labor force. THE BIG NEWS: AVERAGE HOURLY WAGES ROSE 3.1%, FINALLY INCREASING AT A RATE HIGHER THAN INFLATION. In past cycles average hourly wages increased by 4.0% when the unemployment rate was at or below 4.0%. This bodes well for consumer sentiment as we enter the all-important year-end holiday shopping season. ← 2019 Stock Market Outlook: Is A Recession Coming?